The development of AKMs is threatening law and order in Western societies. AKMs can be used to control the own population. 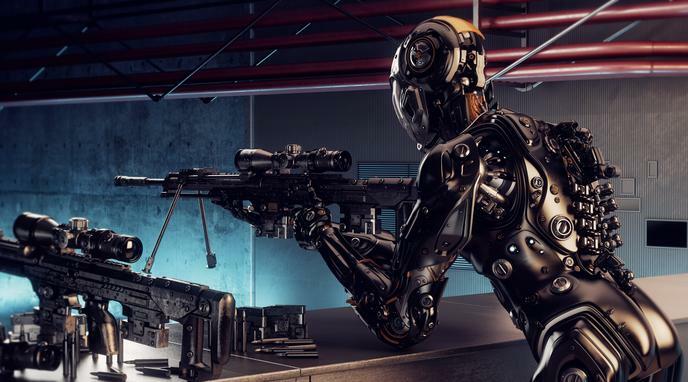 The wealth of real-time data on the movements and social interactions of people makes high-tech societies more vulnerable to robotic weapons because they are more visible to machines. It is dehumanizing to use AKMs/ promoting a step away from the horror of killing making it easier to assuage the conscience thus reducing humanity. AKMs could eventually fall into the hands of private citizens or corporations and be used for mass murder or other illegal purposes. The proposed use of AKMs would not be easily compatible with international laws of armed conflict. AKMs endanger our democratic and free society, since they would allow a handful of individuals to control entire populations using AKMs. AKMs can be used by police to fight criminality and terrorism, therefore make society safer. regulated through no-fly zones and technology that restricts their use in certain areas. The question if AKMs turn into a threat to law and order depends on societal circumstances. In a healthy democracy it is very unlikely that some robots threaten law and order because a strong civil society, effective democratic mechanisms, and a functioning Fourth Estate are protecting law and order. A non-robotic army is just as capable of establishing a military dictatorship as a robotic one. History is full of Western democracies falling into dictatorship without the use of AKMs.